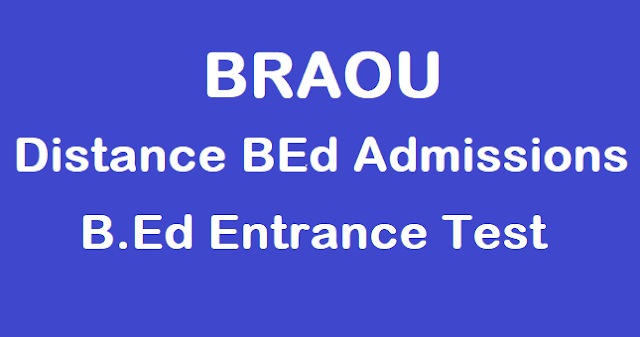 BRAOU B.Ed Entrance Test 2018/Distance BEd Admissions 2018-2019 Notification,BRAOU BEd Entrance Test 2018 Notification/Ambedkar Open University BRAOU BEd Admissions 2018-2019,BRAOU B.Ed Entrance Test 2018/Distance BEd Admissions 2018 BRAOU Distance BEd Admissions 2018-2019, Dr.B.R. Ambedkar Open University(BRAOU), the Department of Education is offering B.Ed. Programme, approved by NCTE (National Council for Teacher Education), from 2008 in Telugu medium. So, BRAOU, Department of Education will issue the B.Ed. Entrance Test 2018-2019 Notification in this Month and the University invites the online applications from the eligible candidates for admission into B.Ed. through Entrance Test. This notification Eligibility Criteria, Educational Qualifications, Age limit, How to apply, online application form, Last date for apply, registration fee, course fee, Exam date, Hall Tickets, Results and more details are provided here. The B.Ed. Programme offered by Dr. B.R. Ambedkar Open University (BRAOU) is an innovative programme utilizing self-instructional material and information technology along with interactive personal contact programmes. It aims at developing understanding and competencies required by practicing teachers for effective teaching-learning process at the secondary stage. The Programme is essentially a judicious mix of theoretical and practical courses to develop the practicing teacher‟s knowledge, skills, understanding and attitudes. Illustrations and cases of relevant situations and need-based activities comprise the core of each course of the programme. a) To strengthen the professional competencies of in-service teachers. b) To develop an understanding of the various methods and approaches of organising learning experiences for secondary school students. c) To understand the nature of the learning process and develop skills required in selecting and organising learning experiences. d) To develop skills involved in dealing with the academic and personal problems of learners. e) To develop skills in selection, development and usage of evaluation tools and to develop an understanding of the various techniques of evaluation in the classroom. f) To develop an understanding of various aspects of school management in organising various instructional and co-curricular activities. The medium of instruction is Telugu. A student should write the answers in Year-end- Examination, Assignments and Records, Teaching Practice and Practical Lesson Records only in Telugu. Eligibility to appear for the BEd entrance exam: Candidate satisfying the following requirements shall be eligible to appear for the entrance test. 2. Candidates should have passed a Bachelor Degree i.e., B.A. / B.Sc. / B.Sc. (Home Science) / B.Com./ B.C.A. / B.B.M. or should have appeared for the final year examination in any of these courses at the time of applying for the B.Ed. Entrance Test. 3. Those appearing in qualifying examination (Bachelor or a higher degree) can also apply. But they will be required to submit the proof of having passed the qualifying examination at the time of admission. Otherwise they are not allowed for admission counselling and their provisional admission will stand cancelled. (A) Teachers presently working (In-service) and have completed at least two years of experience as on 01-07-2014 on temporary / permanent basis in a primary, secondary / higher / senior secondary school recognised by the central or a state government or a union territory. (B) Candidate should have completed 21 years as on 01-07-2014. No upper age limit. Admissions are made strictly on the basis of merit in the Entrance Test. Only those candidates who satisfy the eligibility criteria fixed by the University will be admitted. Centralised admissions will be done on the basis of the score obtained in the Entrance Test conducted by BRAOU. The candidate will be required to submit only the filled-in application form without any enclosures. The enclosures (documents) mentioned in the instructions for filling-in the application form to be submitted later after receiving the letter of offer for admission counselling to B.Ed. from the University after the entrance test. The Programme Centre is the contact point at the local level. Select the programme centre that is convenient to you and write clearly the name of the study centre where you wish to register for counselling and other facilities. The programme centres provides audio-visual equipment, library and other facilities on all working days. The Question paper of the Entrance will have 3 parts for 100 marks. The details are given below. 2. Candidates are expected in the examination hall by 10.00 AM. 3. The entrance test will be for 100 Marks with 100 objective type (Multiple Choice) questions and is of 2 hours duration. 4. The syllabus and the model questions are furnished separately in this booklet. 1. The question paper, except General English section, will be in Telugu. Note: The Qualifying mark in the B.Ed. Entrance Test for all candidates, except SC / ST, is 35. For the candidates belonging to SC / ST communities ranking will be extended below the qualifying mark. Candidates will be ranked in the order of the merit in the B.Ed. entrance test. In case of candidates getting equal mark, Part-C marks will be taken into account to decide relative ranking. In case of tie the marks obtained in Part-B and then Part-A will be taken into account to decide relative ranking. In the case of candidates getting equal marks in each of the parts of the test paper, age shall be taken into consideration for relative ranking among the bracketed candidates, and the older candidates shall be given priority. The rank obtained in B.Ed. Entrance Test is valid for entry into B.Ed. Programme for that academic year 2014-2015 only. Note: Request for Re-Totalling and Re-valuation or personal identification of scripts will not be entertained. The Entrance Test will be held at the Regional Coordination Centres of BRAOU. i. Mathematics: B.A. / B.Sc. with Mathematics as one of the group subjects and B.C.A. candidates with Mathematics at Intermediate level in optional Mathematics stream are also eligible. ii. Physical Sciences: Candidates with B.Sc. who have studied Physics and Chemistry OR Allied Material Sciences under Part-II group subjects. B.C.A. candidates with Physical Sciences (Physics & Chemistry) at Intermediate level as group subjects are also eligible. iii. Biological Sciences: Candidates with B.Sc. / B.Sc. (Home Science) who have studied Botany and Zoology OR Allied Life Sciences under Part-II group subjects and B.C.A. candidates with Biological Sciences at Intermediate level with optional Biological Sciences are also eligible. iv. Social Studies: All candidates with B.A. / B.Com./B.O.L. students with Social Studies background at Intermediate level as group subjects are eligible. (To be submit at the time of Admission Counselling): The service certificate has to be signed by the employer concerned in case of applicants belonging to Teachers, Vidya volunteers working in State Govt. / Local Bodies/ Aided/Private recognized Schools the service certificate has to be signed by the Head of the Institution and counter signed by the MEO. In Case of others the concerned Employer should counter signed. 3. Service certificate as on date of the admission counselling. 8. Intermediate / 10+2 certificate. 9. Study Certificates (IX to Degree) or Residence Certificate. The candidate has to register his/her candidature for appearing B.Ed. Entrance Test in University website www.braouonline.in and payment of registration fee through any AP ONLINE/TS ONLINE FRANCHISE CENTRE across the state on or before 30-01-2018. 3. If any wrong information is provided in the application form, it is the responsibility of the applicant only and the University is not liable. 5. Please keep the application number and receipt carefully with you for further reference. Note: No Physical submission of application either at RCC or Head Quarters of University or at any other places is required.